Since 1944, NSFInternational, in collaboration with manufacturers, regulatory entities, and consumers, etc., has developed public health certifications and standards which help to protect the environment, food and water. It does so to fulfil its main goal, which is to protect and improve human health. 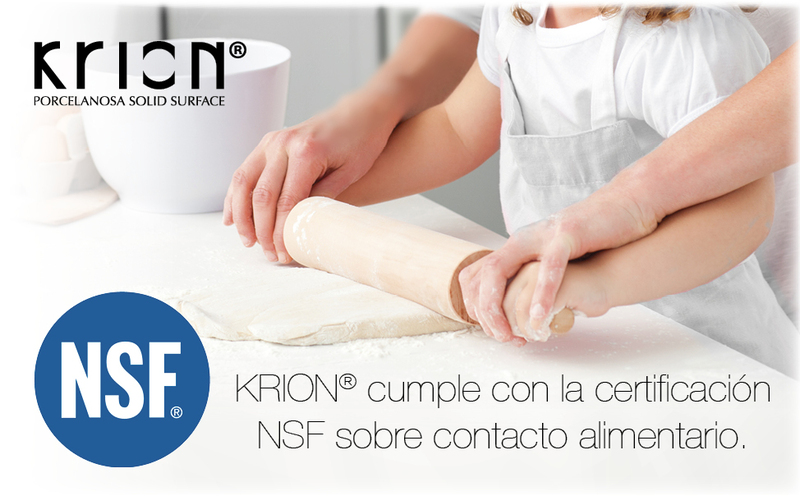 This certification has been granted to KRION® for both sheets and adhesives, making KRION® the only of the large brands of Solid Surface to have it, as well as signifying that in addition to its sheets, its adhesives can be used in food contact areas. There are two types of NSFcertification for food contact: Food Zone and Splash Zone. KRION® belongs to the Food Zone category, meaning that KRION® can be in direct contact with food, unlike products with the NSF Splash Zone certification, which simply indicates that it is suitable for use in areas where splashes or spillages of foods may occur, but not for direct contact. *See http://www.nsf.org for the certified colours. Conforme o estabelecido no regulamento vigente de Proteção de Dados de Caráter Pessoal, informamos que os dados de caráter pessoal que nos proporcionou serão incluídos num ficheiro cujo responsável é a PORCELANOSA Grupo A.I.E. (NIF V-12465118 e sede social em Carretera Nacional 340, km 55,8, 12540 Vila-Real (Castellón, Espanha) a fim de dar seguimento ao seu pedido de subscrição e poder enviar-lhe periodicamente informações que sejam interessantes para si, mantendo-o informado através de comunicações comerciais eletrónicas sobre os nossos produtos e serviços. Os seus dados pessoais podem ser cedidos às empresas do Grupo PORCELANOSA pertencentes ao sector do fabrico e venda de materiais destinados à construção, decoração e acessórios (indicadas em www.porcelanosa.com/empresas.php e em www.porcelanosa.com/buscador-de-tiendas.php) com o mesmo objetivo, mas apenas se der o seu consetimento assinalando a seguinte caixa.